If the refrigerator temperature is not cold enough, food will spoil, which will waste money. If the settings are too cold, energy will be wasted, which will also be a waste money. Regulating unit settings allows you to save energy through these sources without wasting food. This credit card sized temp card from Niagara Conservation has can be hung on the inside of the unit. 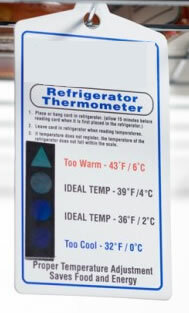 It displays the refrigerator temperature to help avoid the many types of waste that can result from settings that are too high or too low.Use this Refrigerator Thermometer card to check the temperature setting of your refrigerator, 36 °F to 39 °F is generally recommended. Settings that are too cold waste electricity. Settings that are too warm can ruin food and cause salmonella poisoning.